Production will start this month at Chivas Brothers’ new Speyside malt whisky distillery, which was commissioned in 2012. Built using the latest innovations and environmental expertise such as heat recovery technology, the distillery is capable of producing up to 10 million litres of high quality Speyside style spirit per year to support the growing global demand for the blended whisky brands within Chivas Brothers’ portfolio, which includes Chivas Regal, Ballantine’s and Royal Salute. The new distillery, which is Chivas Brothers’ 14th operating malt whisky distillery, is named Dalmunach after the nearby pool in the River Spey on whose banks the distillery sits. Every element of the distillery design, including the unique still shapes, has been geared to producing the very highest quality Speyside malt whisky with a rich, fruity character. Laurent Lacassagne, chairman and CEO of Chivas Brothers, the Scotch whisky and premium gin business of Pernod Ricard, comments: “As global demand for Scotch whisky increases year on year, our confidence in the long-term growth prospects for the category remains strong. The construction of the new Dalmunach distillery is a clear demonstration of our confidence and also of our commitment to invest to meet the significant growth potential. The distillery architecture has been inspired by the shape of a sheaf of barley reflecting the core ingredient of single malt whisky. It houses eight copper pot stills (by Forsyths), with a tulip shape used for the wash stills and an onion shape used for the spirit stills, replicating those from the Imperial distillery which was situated on the site until 2012. In a departure from distillery traditions, the stills have been positioned in a circular design. Other original features from the previous distillery have been carefully incorporated to ensure a sense of heritage remains intact. Red brick from the original mill building has been reclaimed to create a feature wall in the new entrance area, and wood from the original washbacks has been used to form an entrance ‘drum’ and adorn the gable walls of the new tun room, which contains 16 new stainless steel washbacks. A new 9.5m diameter mash tun (by Briggs of Burton) has been installed which draws spring water for production from the site’s original distilling water sources. Situated on the banks of the River Spey, the Dalmunach distillery will not be open to visitors but will be visible from the nearby Speyside Way walking trail. Great care has been taken to ensure the external façade of the distillery is in keeping with its surrounding environment and the traditional architectural style of the region, thus providing an interesting and fitting new viewpoint for passers-by. 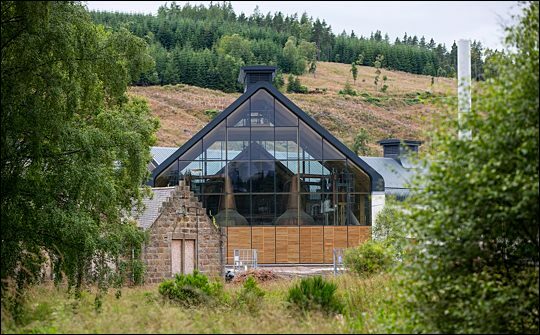 The construction of the distillery was managed from start to finish by Douglas Cruickshank, who stepped back from his role as Chivas Brothers’ production director last year to concentrate on the new build. The project is a fitting end to Cruickshank’s career prior to retirement which began at the age of 15 at the Imperial Distillery and has now come full circle as he restores distilling to the same location after a 16 year slumber.